Lexian Qinpu has 6 folios, the first having essays, the latter five having 35 melodies, all with lyrics. 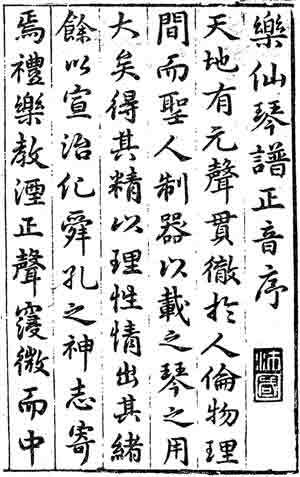 According to the preface in Qinqu Jicheng (VIII/iii) it was compiled by Wang Shanwu (Wang Shanyu? ).3 The full title of the handbook is Lexian Qinpu Zhengyin [Correct Sounds of the Qin Handbook for Enjoying Immortals]). Folio 1 begins with a preface dated 1623 by Zhu Zhifan.4 There is then then Wang Shanwu's own preface followed by several essays. The 35 melodies are in folios 2 to 6. As yet I do not know of any connection between the present handbook and those previous ones (further comment under Anhui). The full title is 樂仙琴譜正音 Lexian Qinpu Zhengyin. The title could be translated as (Correct Sounds of the) Qin Handbook for Enjoying Immortality, but I think the idea here is to enjoy the immortality of qin music and the people who created it. This image is copied from QQJC VIII/347 (see more). He is not mentioned in any of the qin biographies. Huizhou is in Anhui upriver from Hangzhou: also Xin'an (新安休邑: Anhui/Zhejiang?). The essay mentions 皖南徽州 Huizhou in Wannan and his being 制墨 an inkmaker. 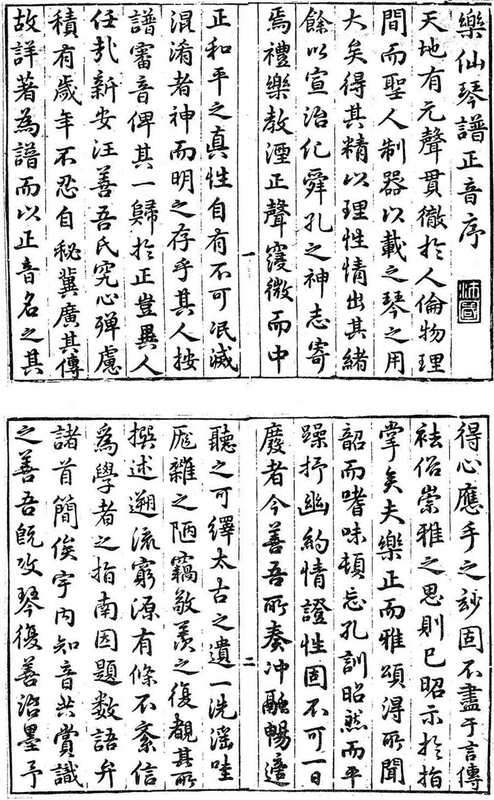 The essay does not make clear Wang Benwu's connection to the 新安汪氏琴派 Qin School of the Wang Family of Xin'an. There are no available studies of this school, so the comment above that it"was formed from both the Zhe School and the Jiang School" seems basically to be speculation.